"12. What is his Nationality? Moorish American." "13. What is Your Nationality? Moorish American"
"14. Why are we Moorish Americans? Because we are descendants of Morrocan and born in America." 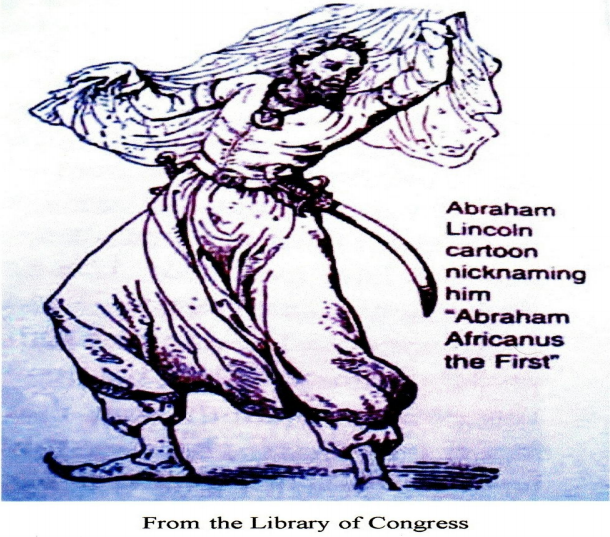 Depiction of Abraham Lincoln as "Abraham Africanus the First" It was common in those days to create political cartoons making fun of the fact that Abraham Lincoln was of Moorish descent. The Moorish Chief by Galerie Eduard Charlemont circa 1878 C.C.Y. 1878 as The Guardian of the Seraglio, it was purchased by John G.
and his leading man a star. the reigning emperor, Charles V." See link here. Your Lawful Notice of Name Correction is a Lawful Writ / Affidavit of Fact that, if challenged, must be rebutted point for point in a court of law. Written By Nun Nagi El May 8th, 2018 C.C.Y., Shaban 22nd, 1439 M.C.Y. Remember when your mother or father would warn you not to go outside without your raincoat on? Why would she or he do this? 1. Because they love you. 2. To keep your body dry and warm from the negative effects of the weather. 3. You were probably too young or too ready to go outside and play to already have one one. Most unconcious moors and forigeners would have not clue as to why someone would need to have a Lawful Writ signed, witnessed and sealed for the public record to operate or do business on the land but as history has shown us assumptions can be costly. As the Nation's of the Earth have already affirmed at Article 6 of the Declaration of Rights of Indegenious Peoples; "All People have a Right to a Nationality." See Black’s Law Dictionary 4th Edition page 1198. Moorish Americans and Scholars should keep in mind that the Name in a Cultural as well as Civil and Political indicator of status on a number of various levels throughout the world. The Moorish Fez and Turban are associated with one of the Worlds largest and most vast empires known to man. The Moroccan Empire now under the heirship and control of the Moorish Empire. The secrets of which are kept in plain sight within Northwest Amexem, and known only to Moorish Science Adepts and those high level Masons and Eastern stars, Shriners, Priesthood, within the churches, mosques, synagogues, temples who in turn control all of the known and unknown, fraternal organizations and cultural clubs who publicly support the Arts and charities that funnel the money back to the churches and other corporations and their foreign owners who without formal rebuttal are able to legally though not Lawfully, occupy the very estate of the ‘sleepy headed’ moors. See Black’s Law Dictionary 4th Edition page 413. As we are all forced to make changes in this Aquarian Age we must take due consideration of the Prophet’s instructions that if we did not do anything else that we must proclaim and declare our nationality. He stated this divine prophecy and his spirit lives today in his words and instructions for those moors who would have the Eyes to See and the Ears to hear his message, Then and Now, would be saved ‘in a conflict that could not be told in words’. Today those who identify themselves as Negroes, Blacks, Coloreds, African-Americans, Puerto Ricans, Mexicans etc. are surely treated as less then and Not a Part of the Human Family thus far in this grand experiment. Therefore, it is incumbent upon moors not to continue to ignore their obligations and responsibilities to their Mother and her womb. Moors being forced to make changes at the but of the sword must Proclaim and Declare their Nationality for the Private and Public record. Those whom you know and love make the best witnesses for this endeavor as they can best speak to your knowledge, sincerity and character upon a subpoena or request for more information for the record in a Court of Law. This must be acknowledged in a red wet ink signature to indicate a living flesh and blood person has signed intending to witness a lawful document. Once someone has obtained such signatures they may submit them for review and sealing via, the site. Below are templates of the Name Correction to assist you in process.